Abandoned an onion on the chopping board, halfway through cooking lunch yesterday, to spend an hour sketching because I haven’t been doing much drawing lately, and I have missed it so much that, suddenly, it was the only thing I wanted to do. 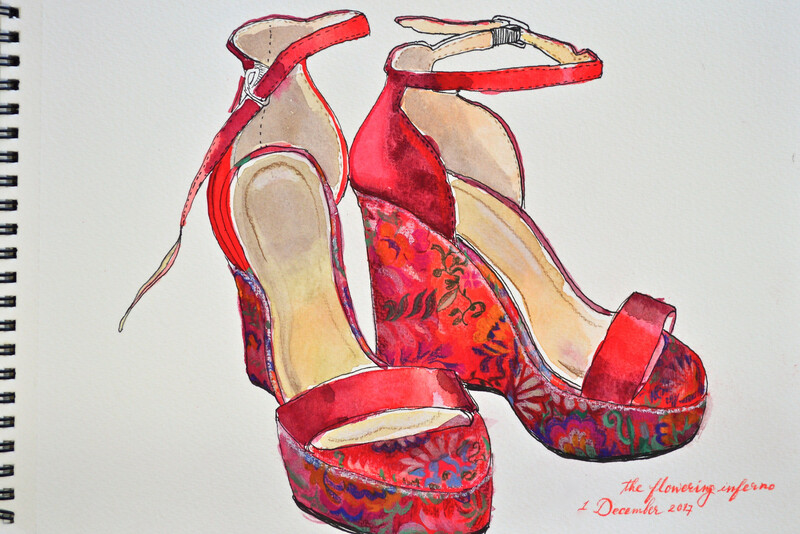 For a subject, I picked this pair of Dragon Lady high heels (because I always knew I would draw them.) These shoes hang from the corner of a bookshelf at home…I didn’t buy them to wear (they’re so high that they’re ridiculous) but as decoration. I treat them the way you’d treat a painted pair of wooden clogs, or a bark skirt from Papua New Guinea, or an antique kimono…a kind of textiles and costumes branch of anthropology. I love that these cheap, mass-produced contemporary shoes—made in China, ironically—are now merely playing to the sort of Hollywood stereotypes of Oriental exoticism and sensuality that the image of a cheongsam (or qipao) from Shanghai in the 1920s also evokes…and that they are being marketed on shopping sites for Western women who want to dress the part. It’s a funny “retail culture meets cultural appropriation” where Chinese manufacturers are peddling Chinese stereotypes to non-Chinese.